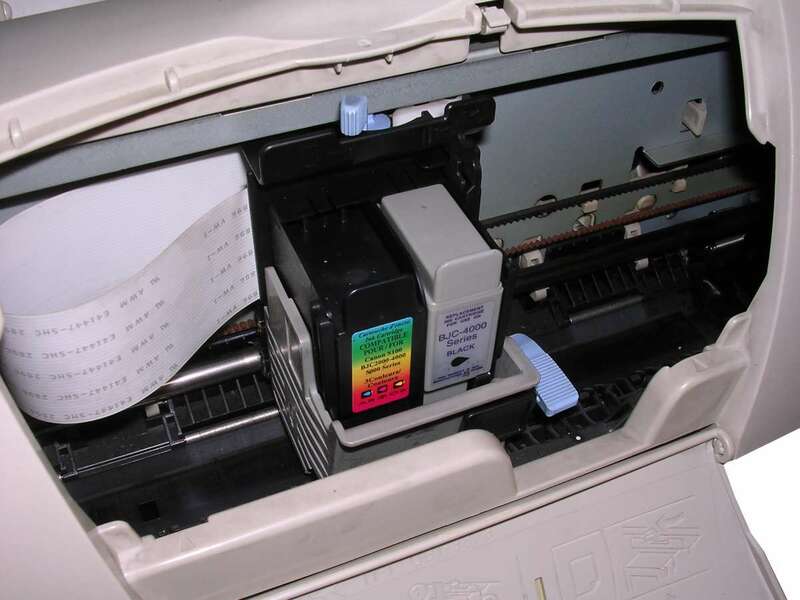 Printers were one of the first output devices. First, electric typewriters and teletypes were connected to computers as printers. Later small printers had mechanisms similar to daisy-wheel typewriters. 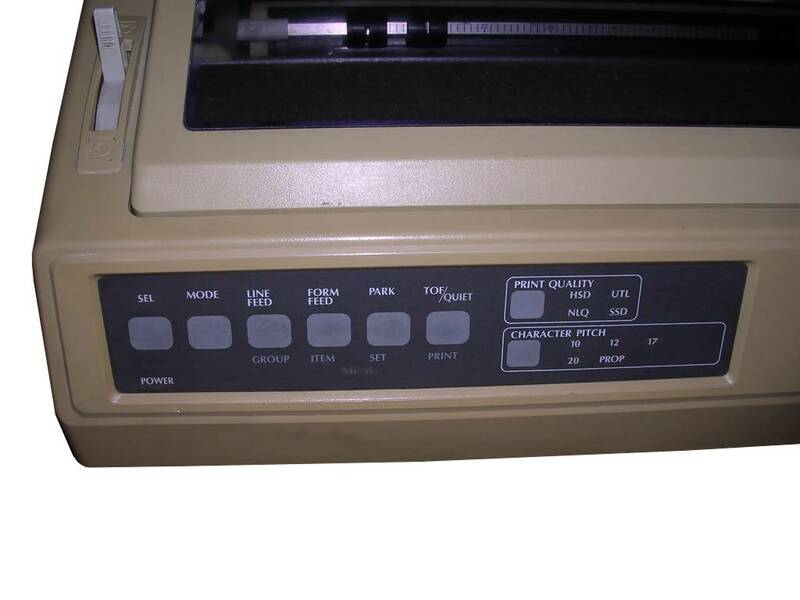 Important point in printers history was to use series of pins striking paper instead of constant font - it was possible to add more fonts to dot matrix printer. In 1980s high-resolution printers used thermal-colouring paper, but this requirement made it problematic. 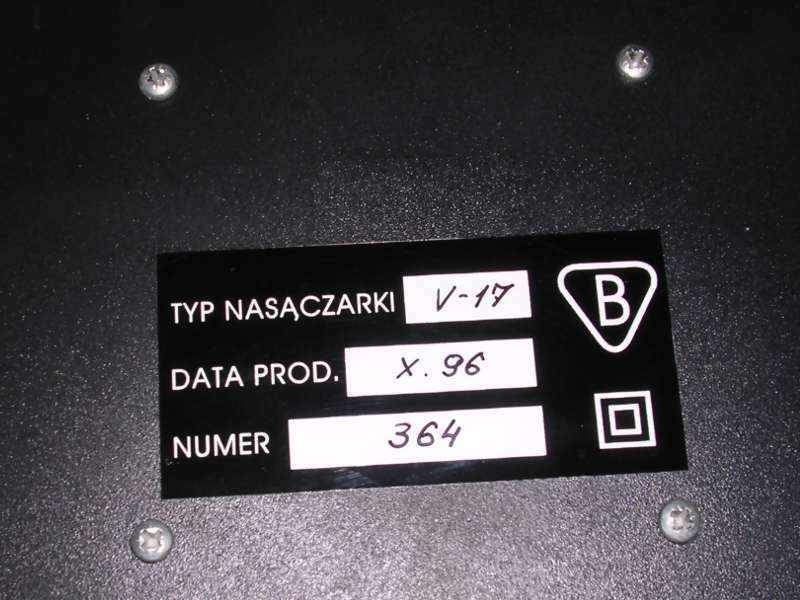 As a response, ink jet printers bacame production-ready. 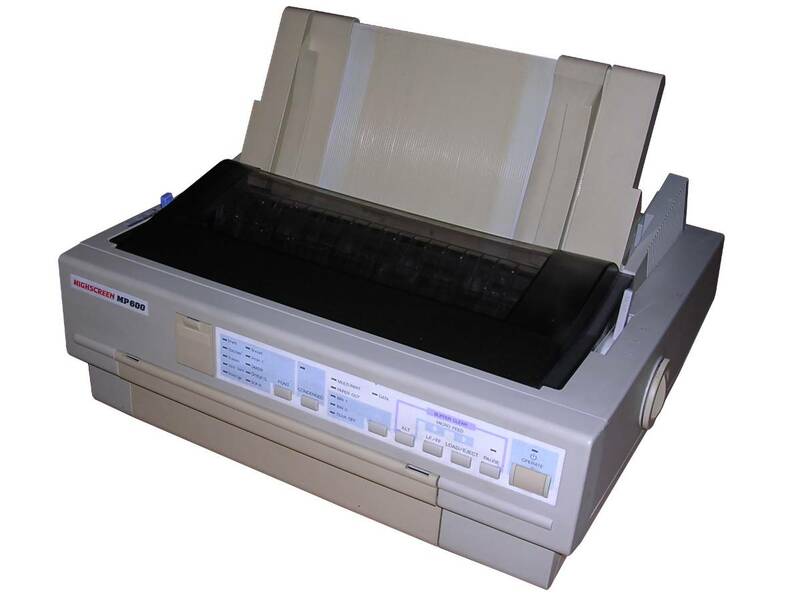 Although laser printing was around since 1970s, it was complex and expensive technology so it became affordable by typical home user in late 1990s. This is a simple machine: An electric motor, switch and speed regulator. 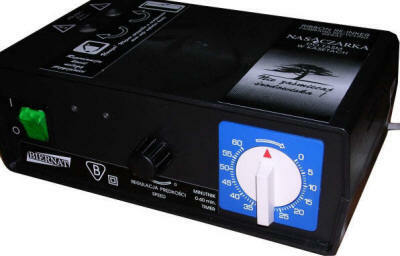 Additionally timer, like one used in electric ovens. 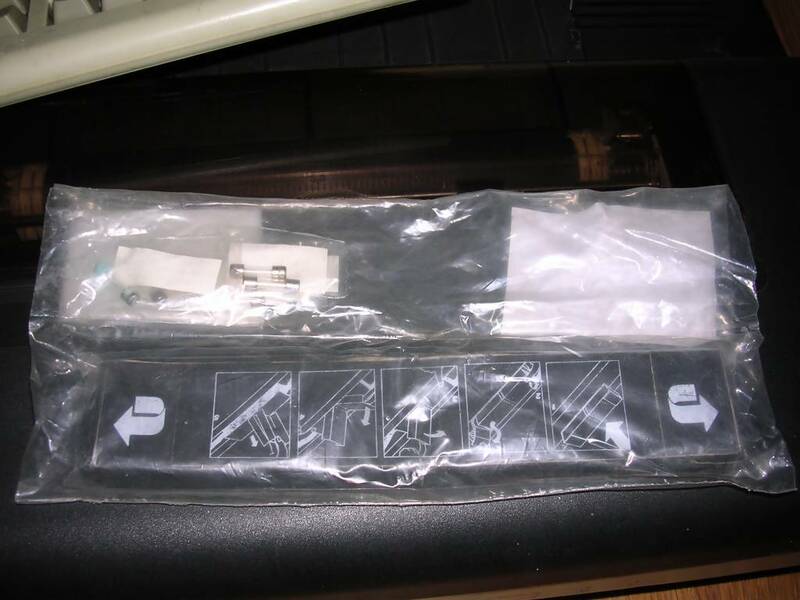 Everything in a large casing with replaceable protrusions to hold many dot matrix printer ribbon cartridges in place. 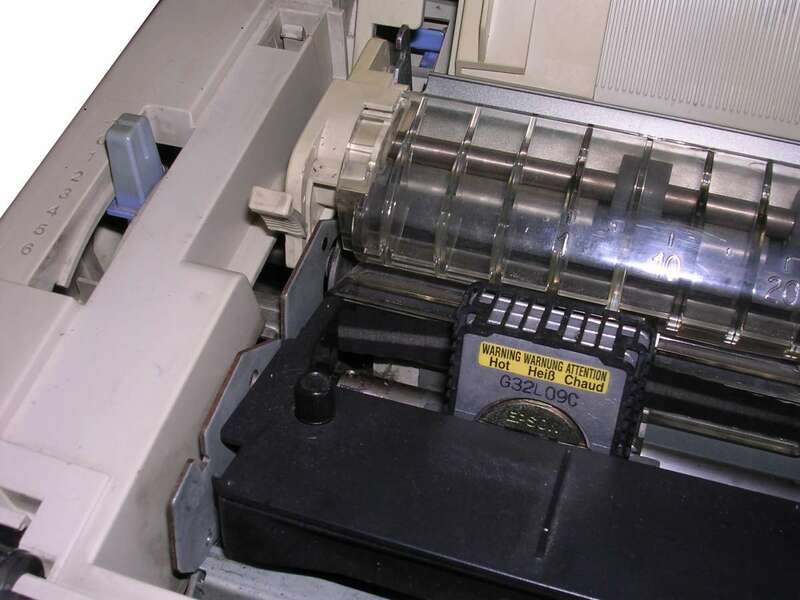 The motor moves the dot matrix printer ribbon, rubbing it against wheel made of soft felt. This cylinder is periodically saturated with black ink. In some units the ribbon is rubbed against two wheels, in some with one. The ink is transferred to ribbon and after few passes it can print like a new one. 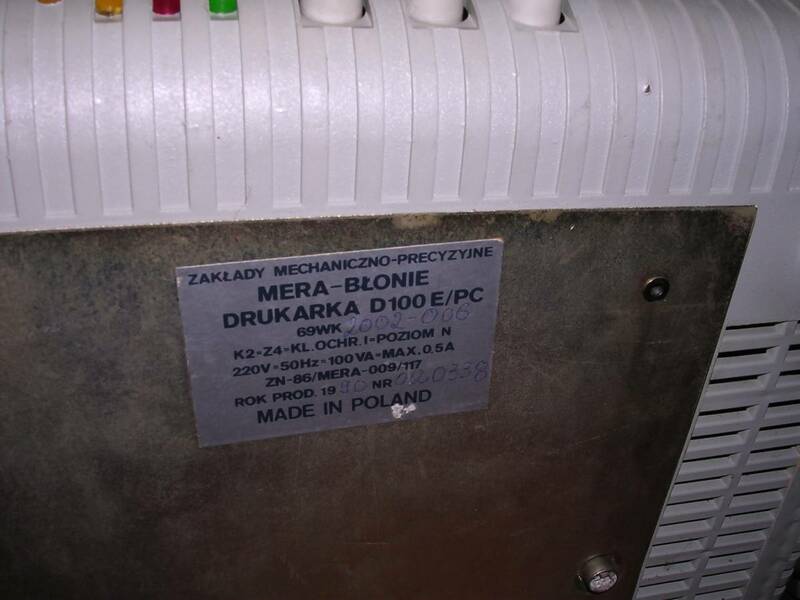 These devices were made in Poland and in 1990 even a Polish patent for this device was filed, and "Młody Technik" ("Young engineer") magazine wrote about it. 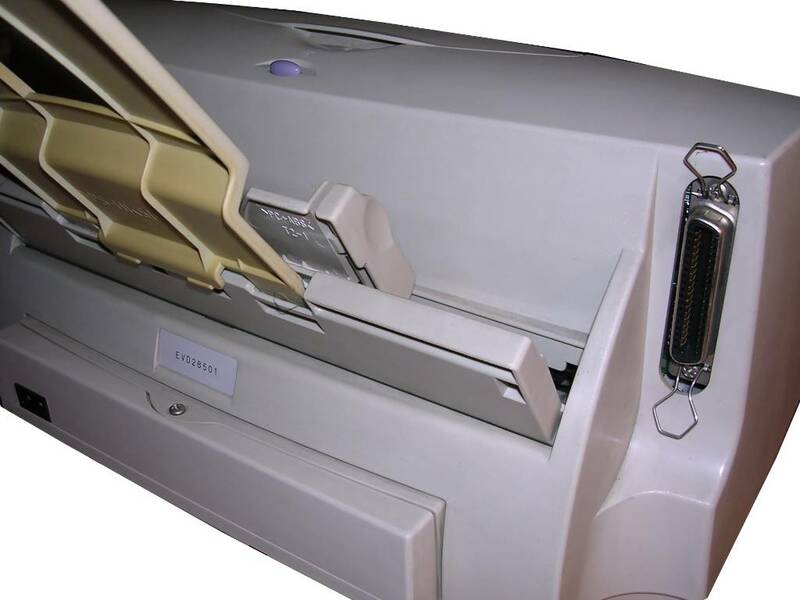 They were commonly used by companies to re-generate printer ribbons on large scale. These ribbons were then sold as re-generated. Usually, these devices were passed for outwork jobs, so it was even cheaper for these companies as electricity was not their. Manuals, if any manuals were accessible, had "very useful" instructions like: "Amount of ink needed: 0.5 - 2ml per cartridge, regeneration time - 5 to 25 minutes per cartridge, Rotation speed should be optimal"... and nothing more. The main rule was that if the ink lands on nearby walls (and the user), the speed is deifnitely too high. Early devices had a light bulb inside as resistor for speed regulation, so they heated up significantly and if the ribbon was not going straight it could be jammed. Periodically feeding transfer wheels with ink also causes problems as with the first move the ribbon squeezes ink from it making it not go equally on length. About quality of this process - everything depends on ink used. Good ink will make the ribbon print like new, bad ink may even block pins. 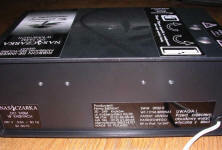 Fortunately this unit is newer so it has no light bulbs inside - speed setting is made with a thyristor. 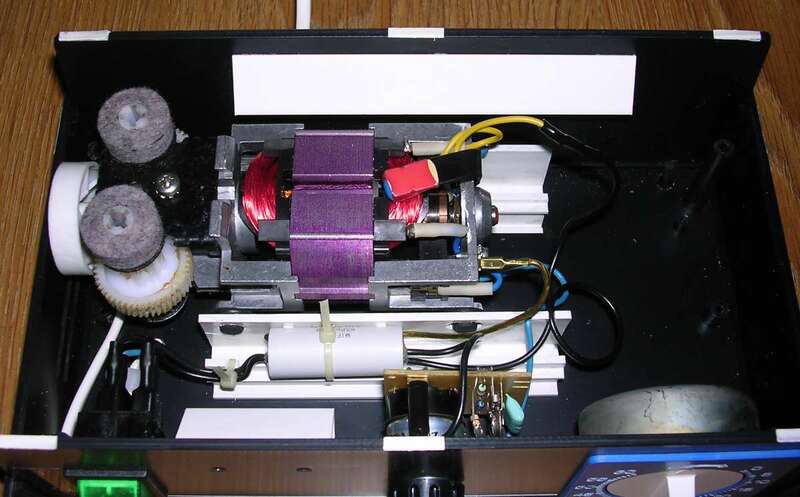 It is nearly the unit described in patent, yet holding cartridge in place is done by other felt cylinder keeping parts. 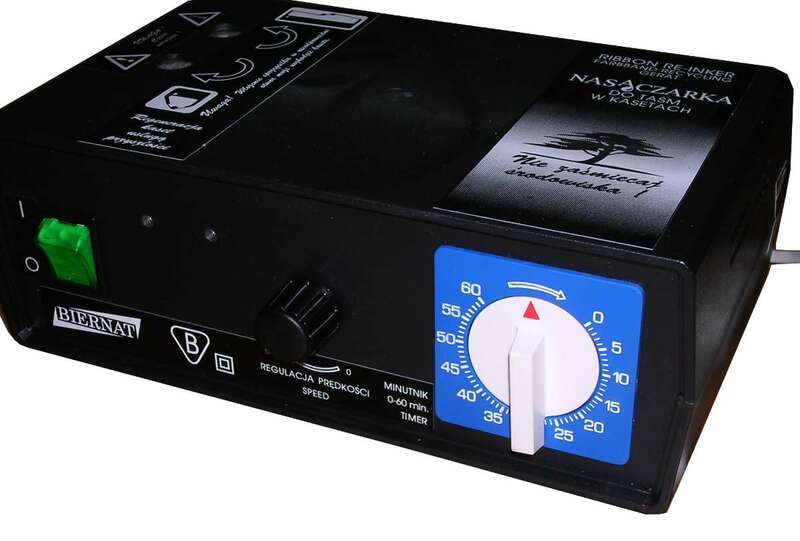 The timer is only for alarm, it doesn't break circuit and is not connected to circuitry at all. It was built in 1996. 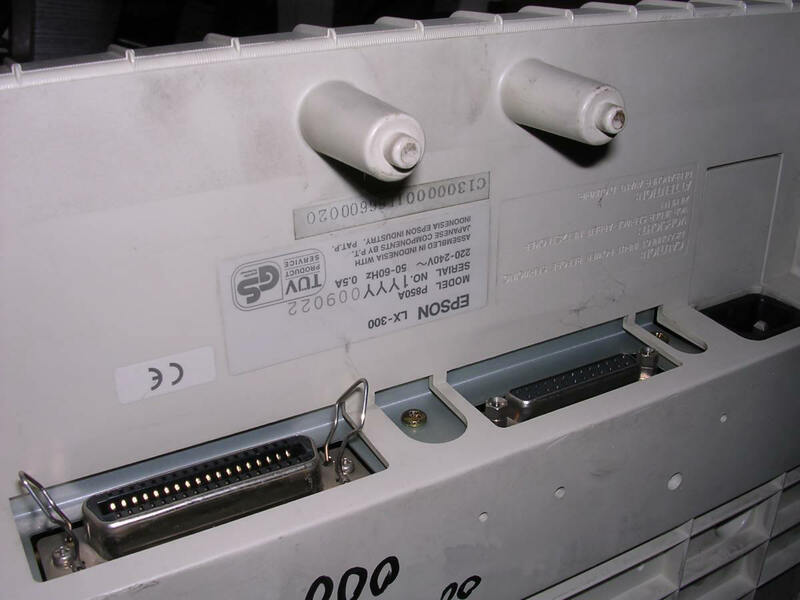 A 9-pin serial and parallel port printer made in Poland in 1990, but manufactured since late 1980s. 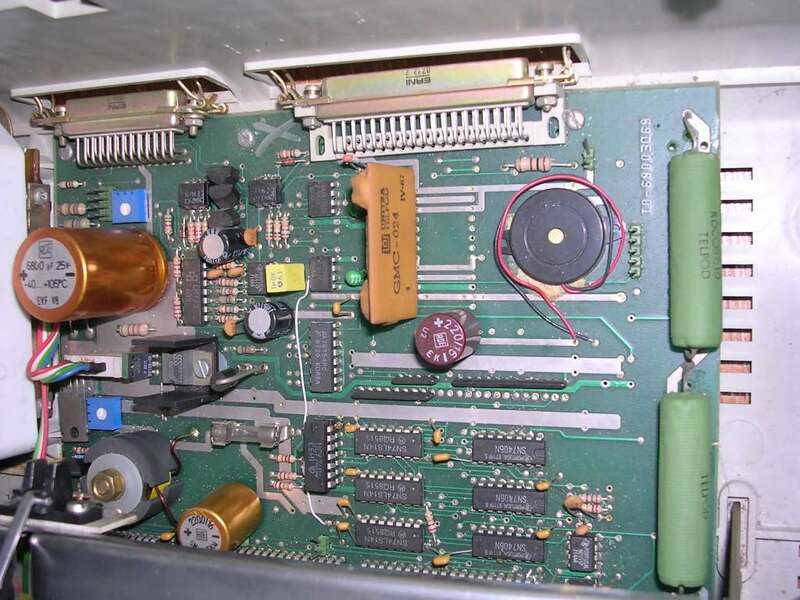 The D-100E/PC was a re-designed D-100 printer, used in microcomputers. 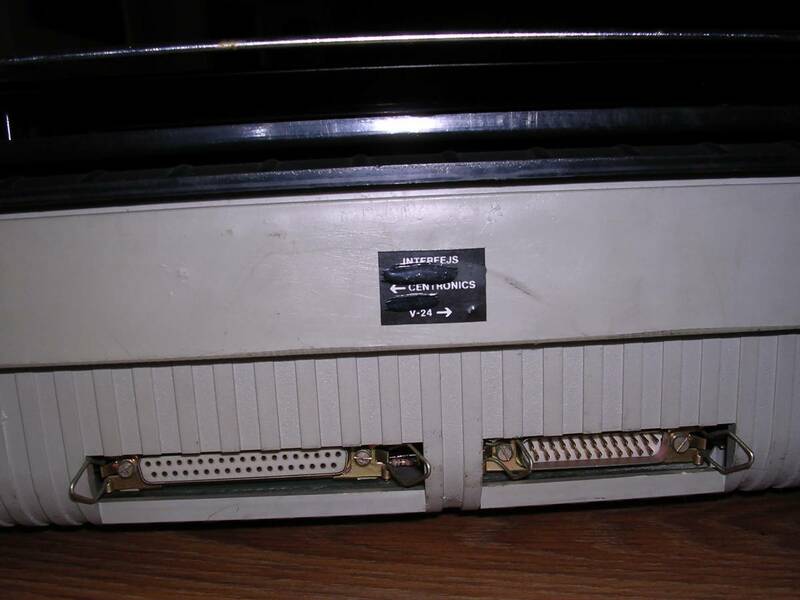 The mainboard has been totally re-made making it possible to print using parallel port. 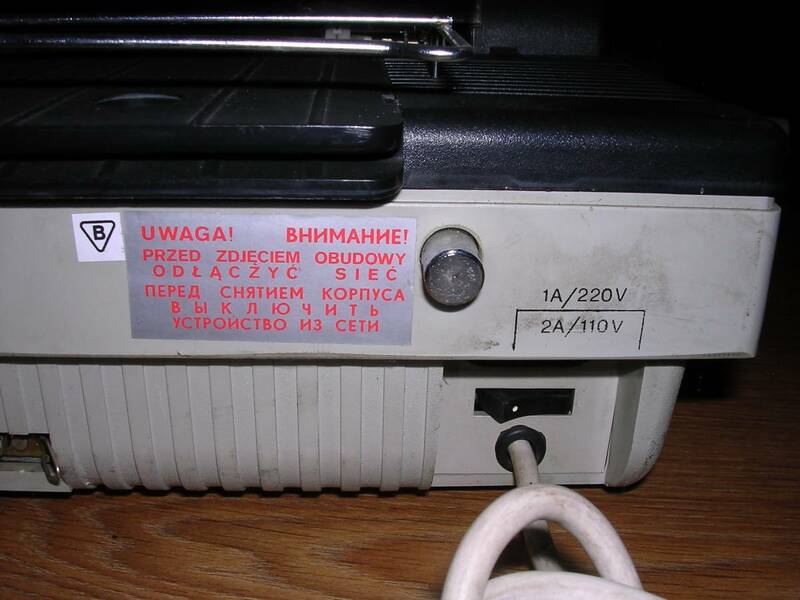 This printer was used with Mazovia and Elwro 801AT Polish personal computers and it was usually printing on continuous paper - although it was possible to put separate sheets, it had to be done totally by hand - like into a typewriter. It was also exported to Soviet Union as CM6325-01, and most documents known are in Russian. 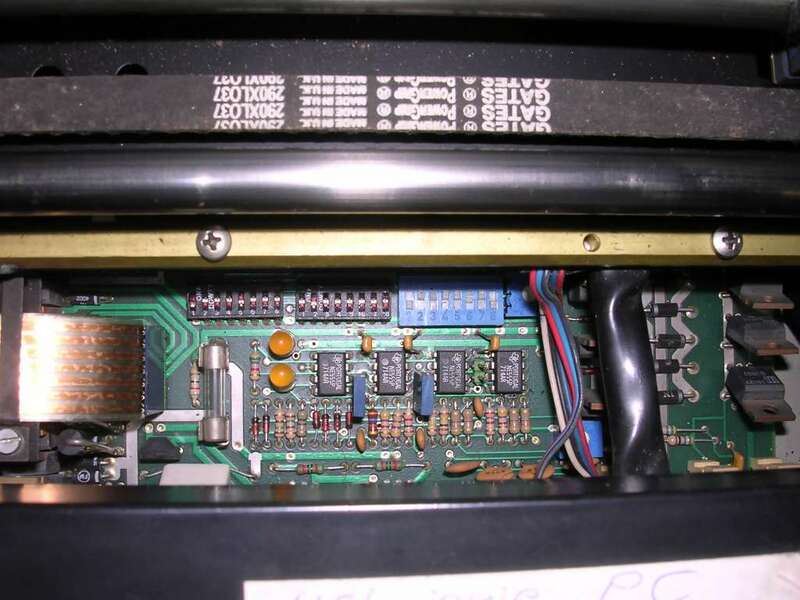 Inside, there is a complete microcontroller system (8031) and control electronics made on a robust components. Soviet stepper motors look like they're for moving something larger than printing head and they indeed have significant force momentum. 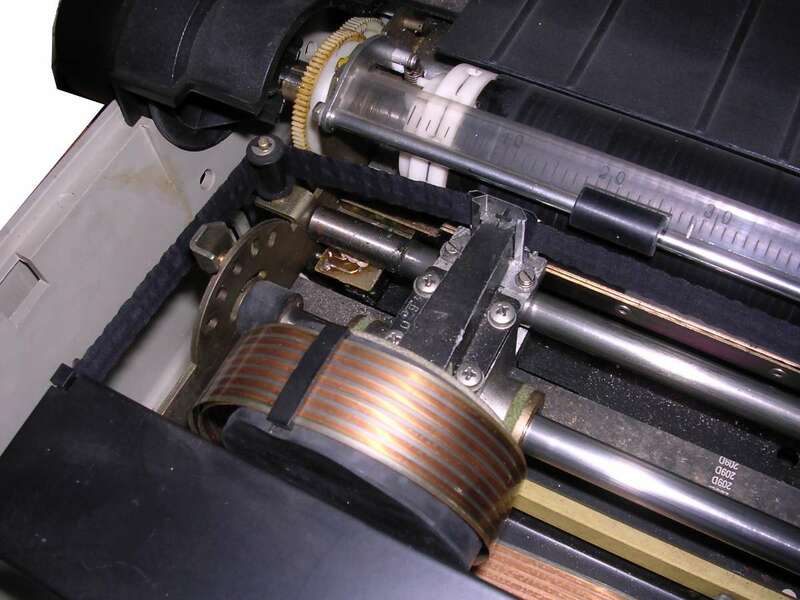 The printing head with strong electromagnets has 9 pins controlled by 9 separate circuits with transistors. The ribbon is not in a replaceable cartridge. 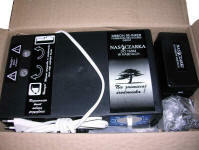 Instead, the contents of cartridge were distributed in special packages. To replace the ribbon, old one had to be removed by hand. 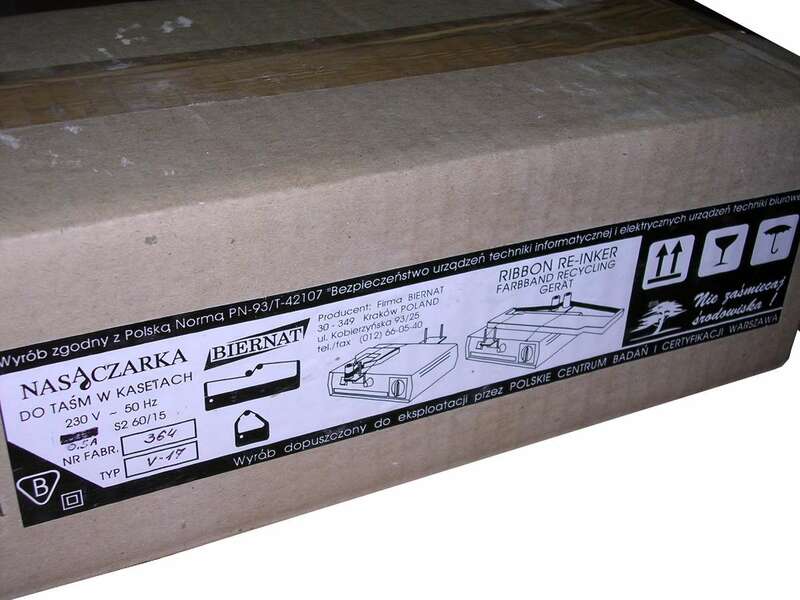 Then, the package with a new ribbon was open and the condensed ribbon was placed in empty container. Usually the set consisted of a ribbon "charge", pack of foil gloves and additional fuses for printer. 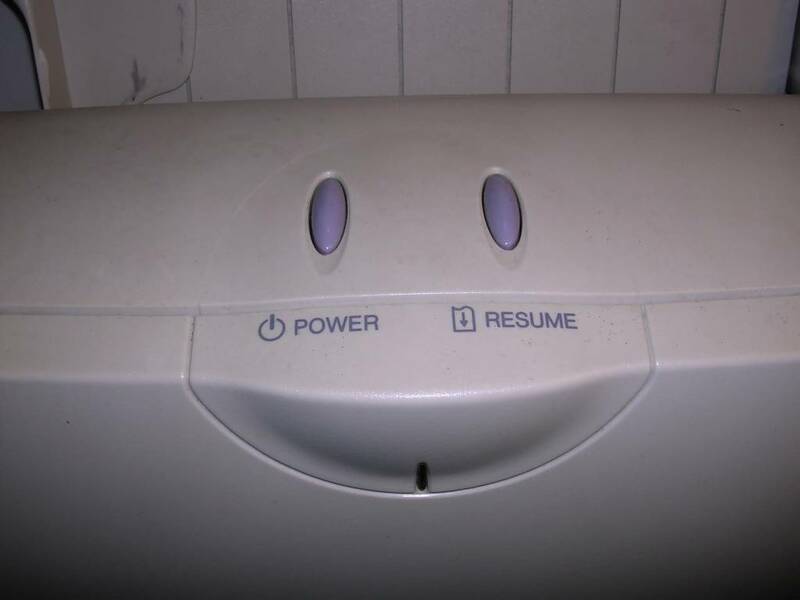 I haven't managed it to run. The printer came with switches configuration not working at all (all switches off). 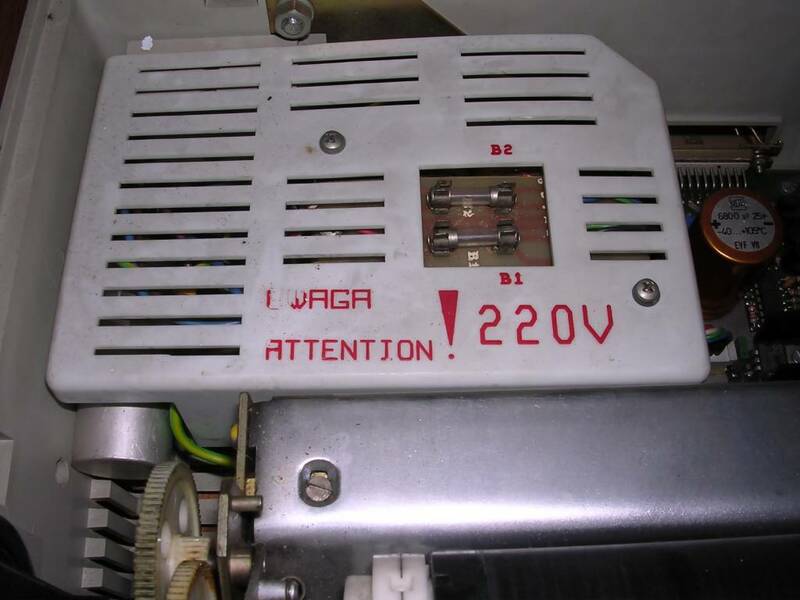 Additionally, another setting was present on a sticker written by the ball-pen, this setting seems not to work too in parallel port. http://zxbyte.ru/download.htm - Technical description IN RUSSIAN. 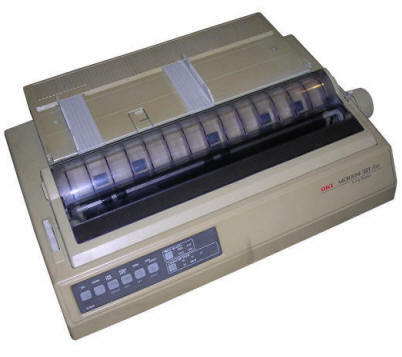 In early 1990s dot matrix printers were used for nearly everything in computers. 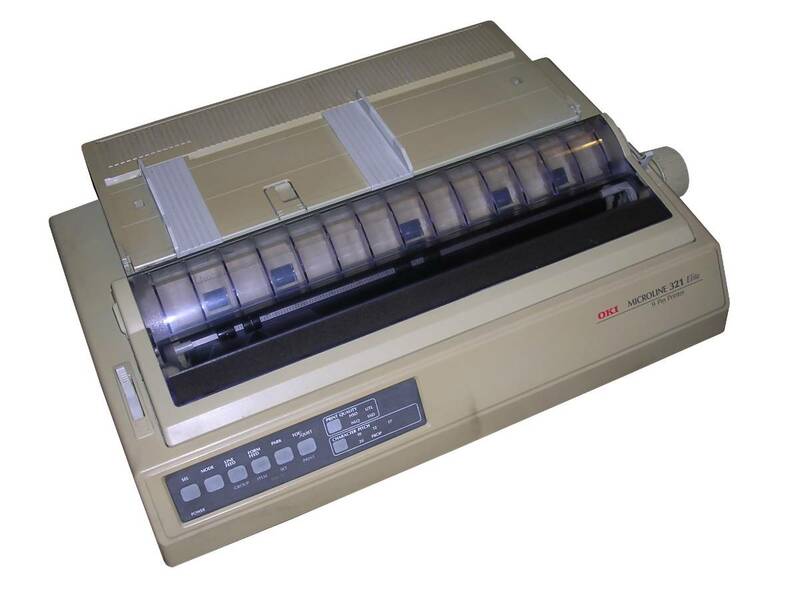 Having a laser printer was an expensive luxury and ink jet printers were not mature enough. Epson, manufacturer of printers, scanners and similar solutions (these times they even made computers), released FX870 and 1170 printers around 1992. 870 model had an A4 paper support while 1170 could use wider forms. Although a bit slow, this 9-pin printer does what is needed - prints in forms, and it can be done many ways. 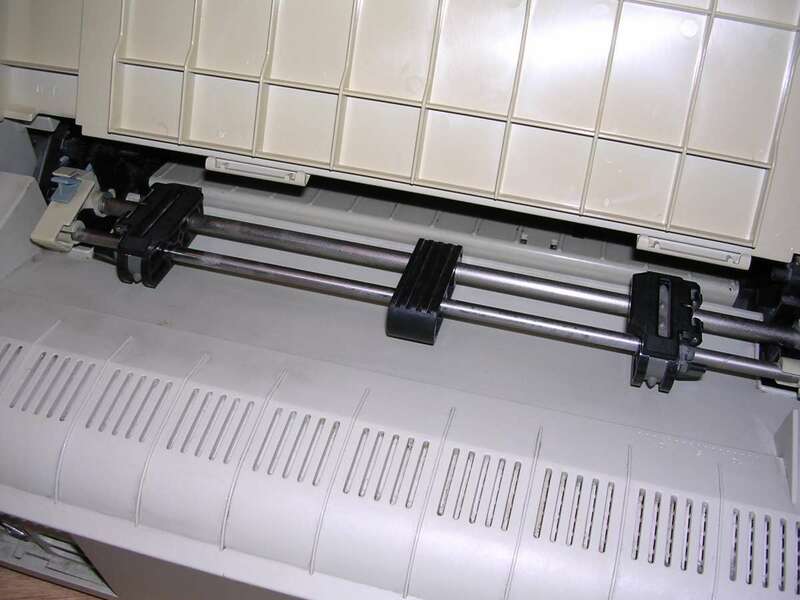 There are 2 continuous paper feeder positions - front and rear, and it's possible to insert separate sheets too. Additionally paper can be fed from the bottom. 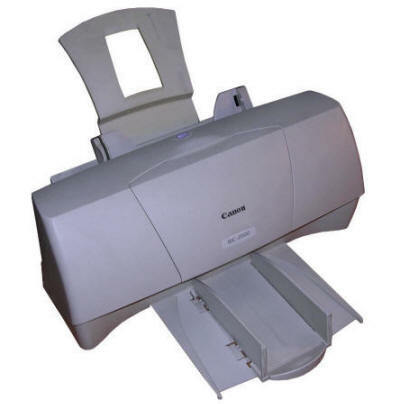 These possibilities made FX line chosen for many point-of-sale and inventory systems, where space was critical - usually printer was just placed on a box with continuous paper, the paper was fed to bottom slot, it exited printer on the rear. 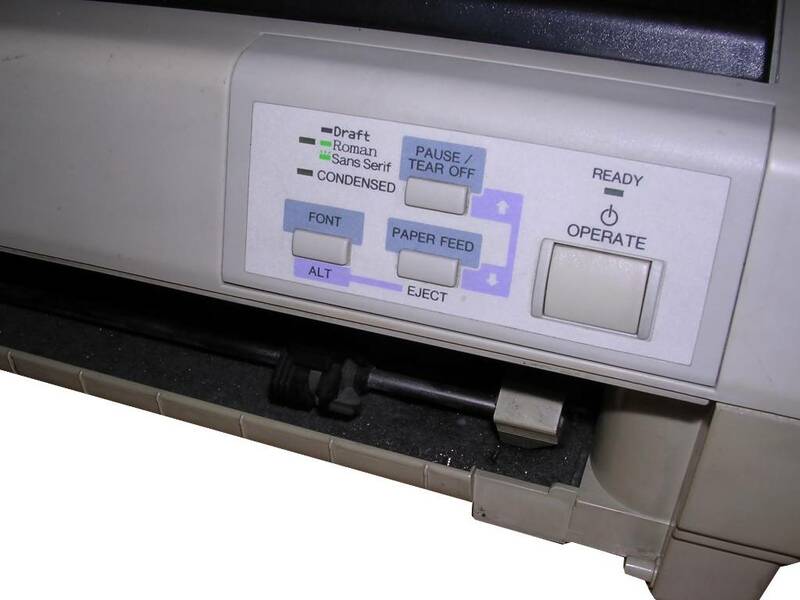 The printer can be configured using its front-panel lights and buttons. Powering on with FONT pressed makes Group 1 menu active. Here user can set emulation and page sizes. When FONT and PAUSE are pressed during power-on, it activates group 2, where codepage settings are set. FONT and FEED activate group 3 to set page length. There is also a "hidden" group 4, where buffer, speed and carriage return are configured by beeps. It should be noted that these printers, like all Epsons from this age, have a knob for moving paper by hand, yet it is working very slowly and is only used to remove paper jams. First of all, let's introduce Highscreen. 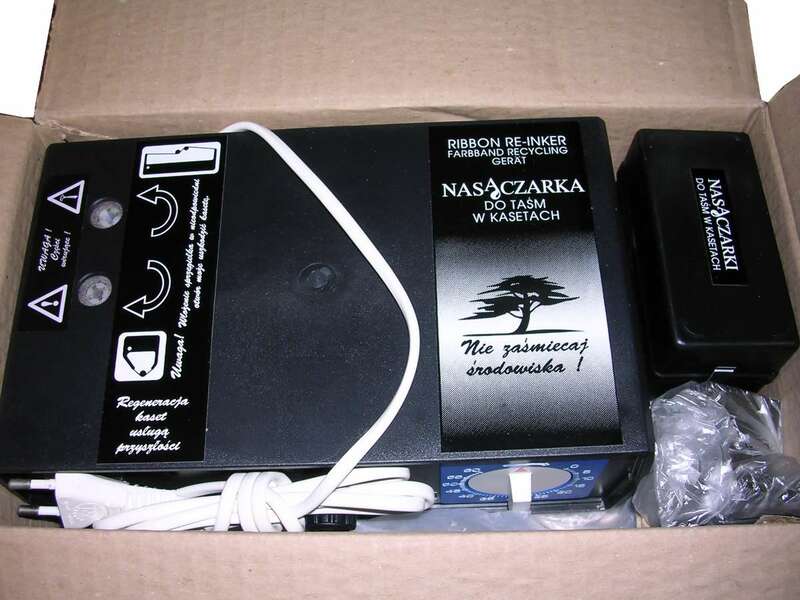 It was a brand of computer hardware sold by German store Vobis. Vobis sold PCs, monitors, accessories and even printers re-branded as Highscreen. 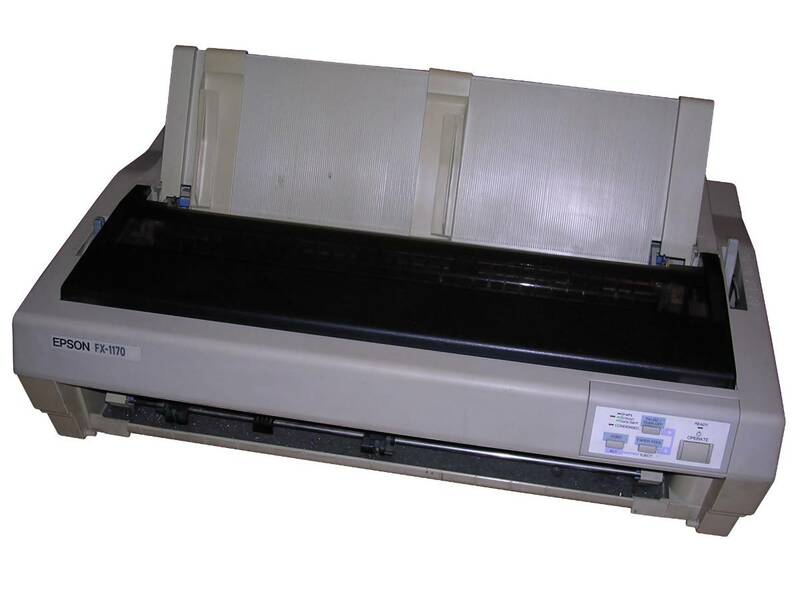 So this printer is a re-branded Epson LQ570, a nice, 24-pin dot matrix printer. 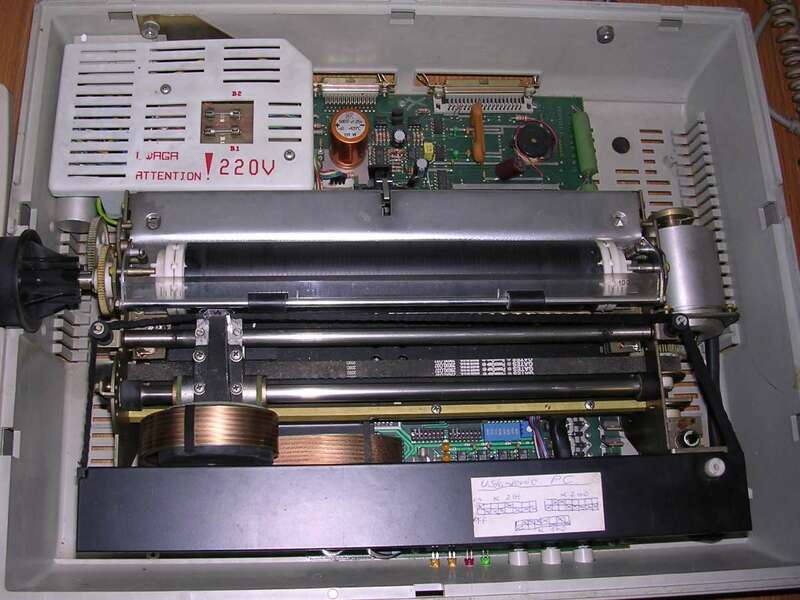 Although the LQ570 model appeared as early as in 1991, this printer is from around 1995. 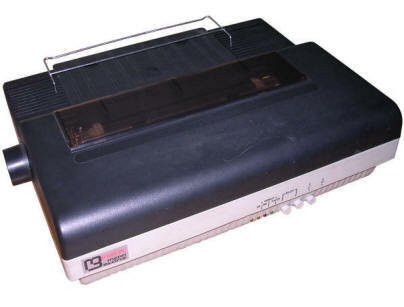 The LQ in original model means "Letter Quality" - it was usually a typical name for very capable 24-pin printers which could use not only using built-in bitmap fonts, but could print external graphics so well that vector fonts looked like professionally printed. The printer could print on a separate sheets as well as on continuous paper using tractor. As with many Epsons, it was possible to use front and bottom openings for a paper. The configuration could be done simply by using DIP switches on the front. The knob to move paper works slowly and should be used only to remove paper jams. 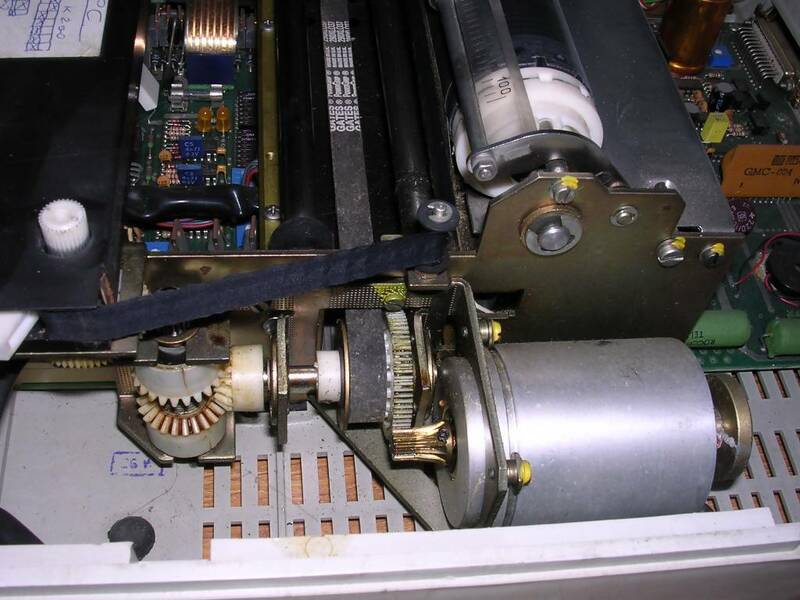 The only problem I encountered with this printer was related to the printing head and was probably characteristic to the specific Highscreen unit - the printer overheated every around 2 pages, stopped operation and waited to cool down. 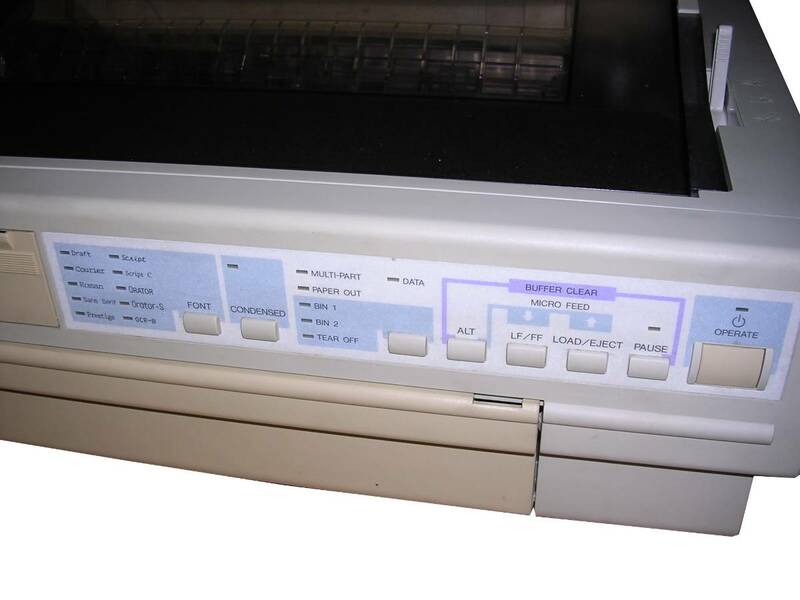 Another 9-dot matrix printer from mid-1990s, this unit is from 1994-95. 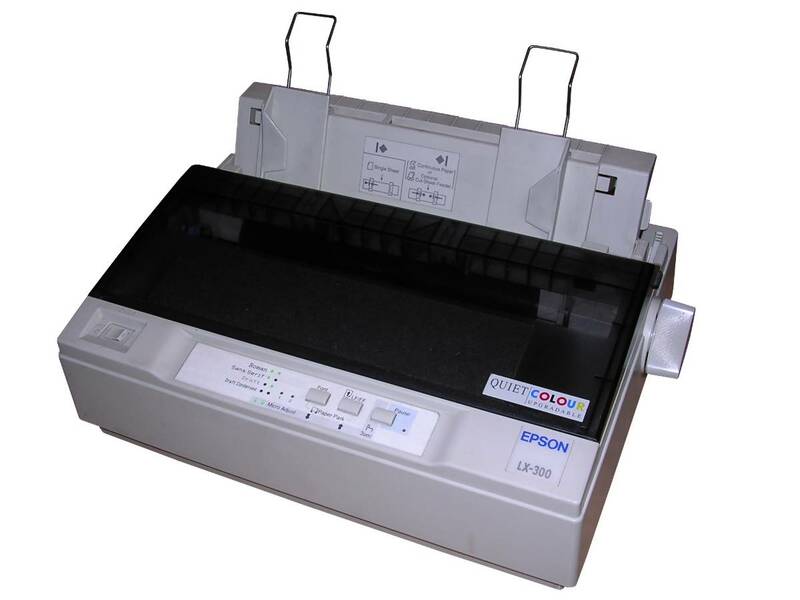 Although Epson units were usually rich in methods to push the paper through unit, this unit allows only to print on separate sheets or continuous paper fed from the rear. 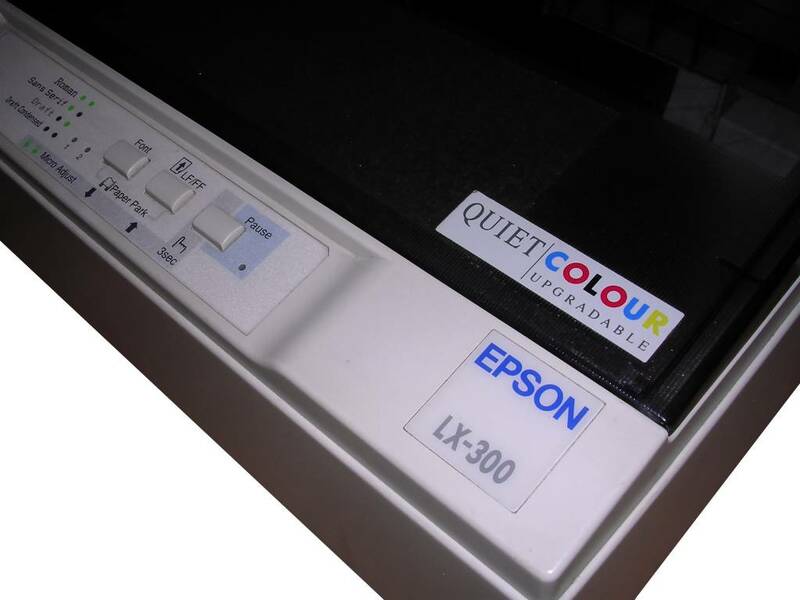 However, LX300 can print very quietly, quieter than other printers from its age. 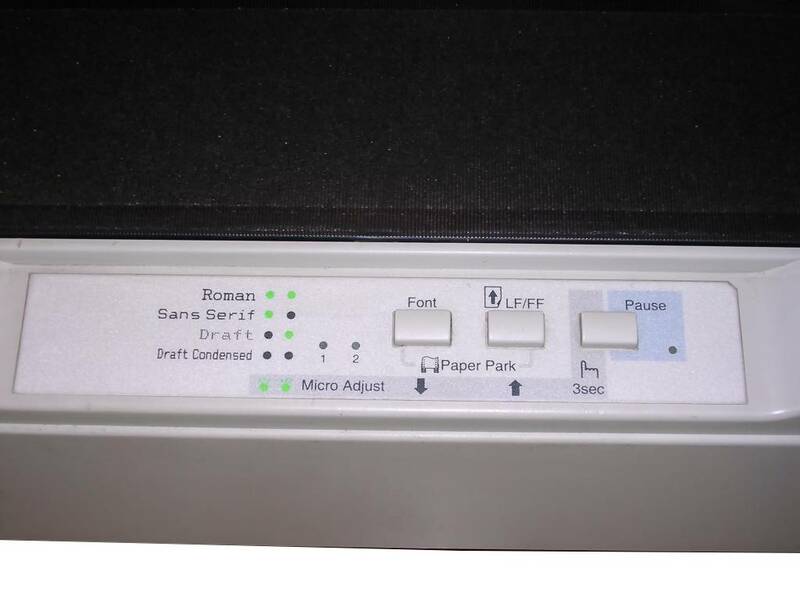 This printer has two interfaces: Centronics and serial RS-232C port. Thus, it may be used not only with PCs, but some old microcomputers. 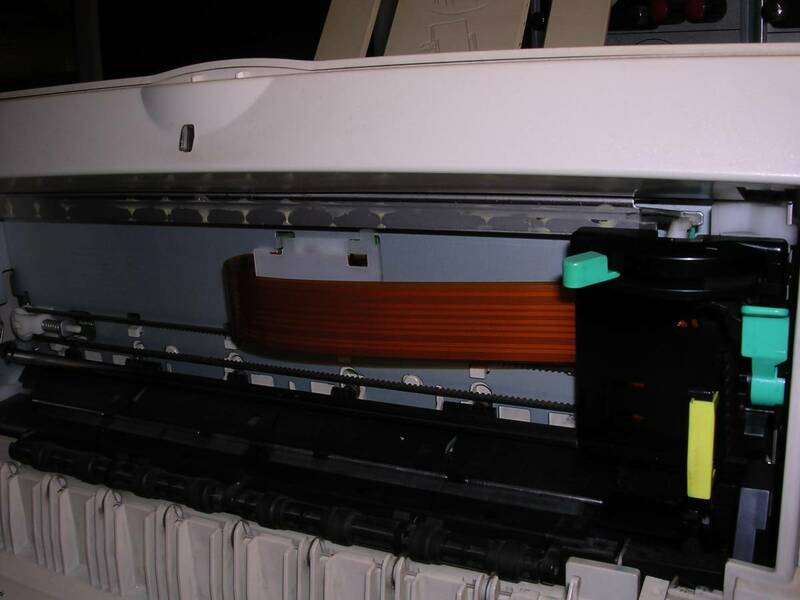 Additionally, the printer has upgrade capabilities - it is possible to add an upgrade kit which moved color ribbon to make printer print in color. The configuration of interfaces, paper sizes and codepages is done using menu printed on the paper - which requires quite large amount of paper and lots of patience. A wide-paper dot matrix printer with 9-pin printing head, released in 1996 it was manufactured and sold for at least a decade. A typical application is printing in forms using continuous paper, so it has a "tractor" for it on the rear. 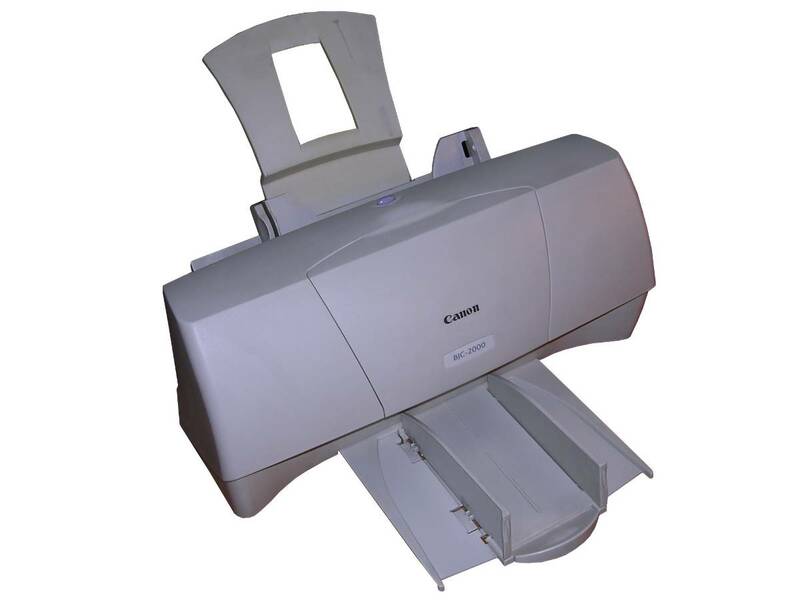 This printer was very popular for printing large accounting reports, inventory lists and invoices. 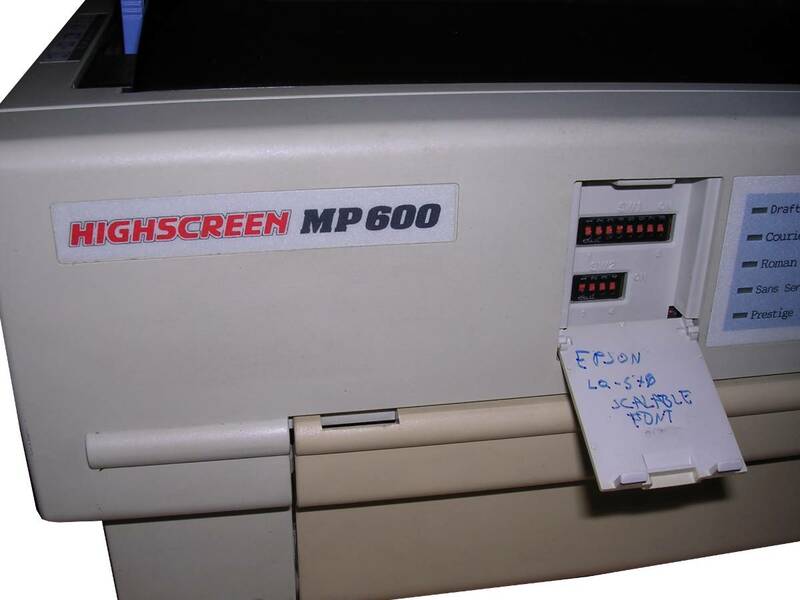 Although it in fact can do some Epson codes, it is mostly used in ASCII printing. The problems are coming usually when it comes to using this printer not in an office system. Large vertical page margins make this unit not so usable for home printing and configuration, made using menu printed on paper, requires patience. 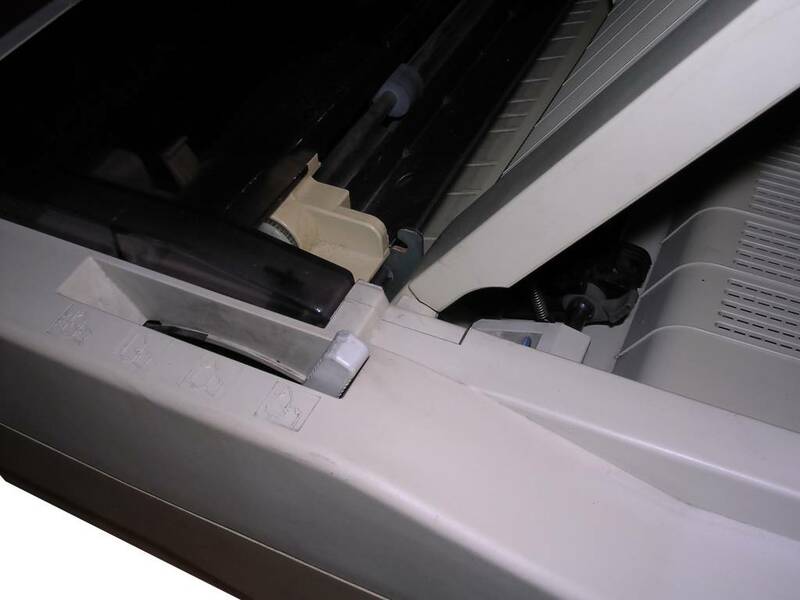 The ribbon is in small cartridge which, contrary to many printers, moves with head. As for a point-of-sale printer, this model is really fast, it prints much faster then many Epsons and it doesn't overheat. 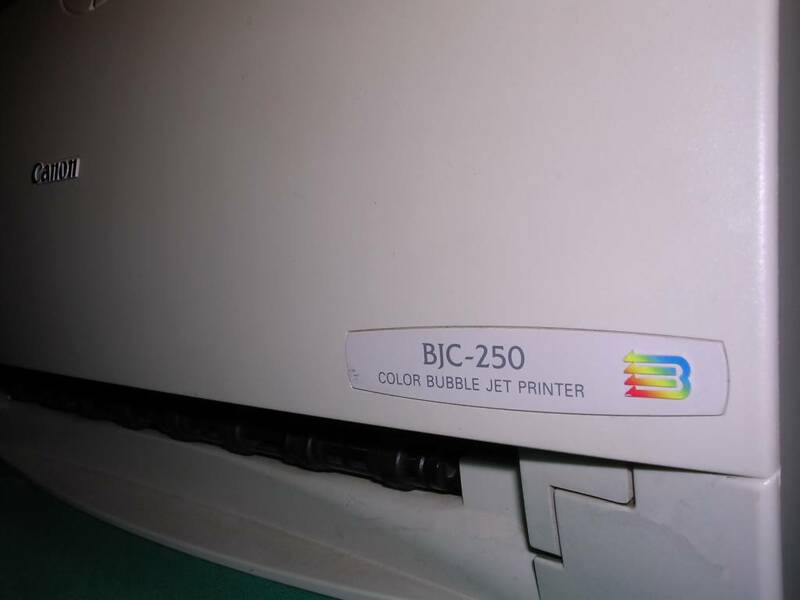 Introduced around 1998, BJC-250 was another printer in the ink jet series called "Bubble jet". 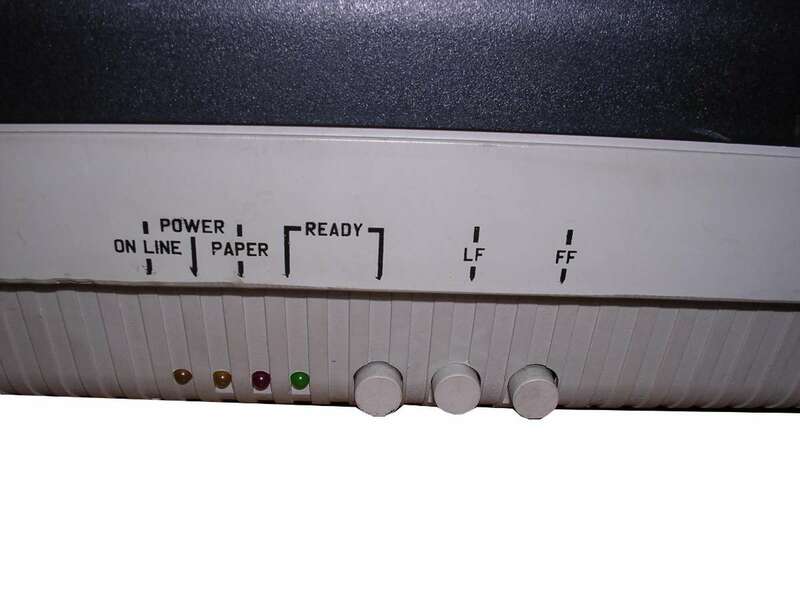 This technology introduced in late 1980s (and with color cartridge in 1994 with BJC-600J model) involved using heaters to push the ink drop from the nozzle to a specific place on paper. Thermal expansion made the ink expand and drop into paper. It was also one of the first cheaper ink printers which offered color cartridge and "photo-quality" with special cartridge and paper. 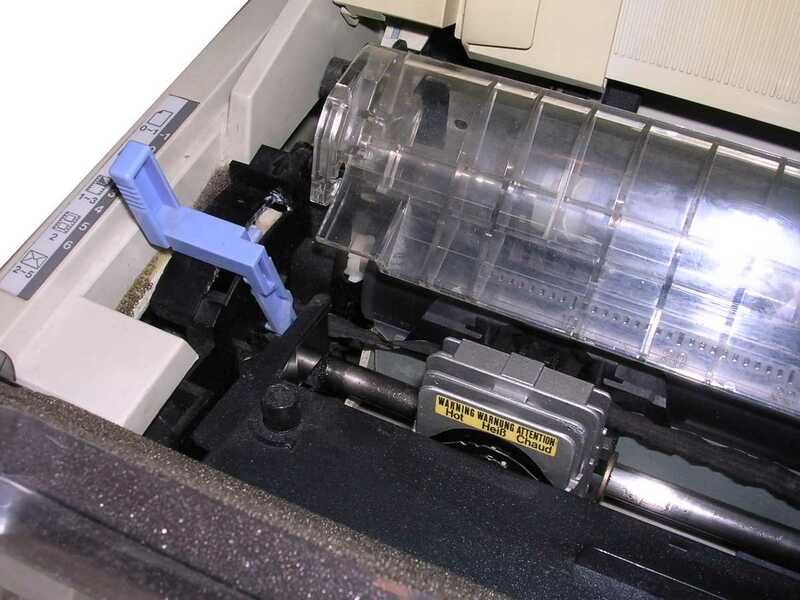 Because of this, this printer got some popularity in home computers of late 1990s. It was possible to print on foil or even fabric if special paper slot on the rear was used. 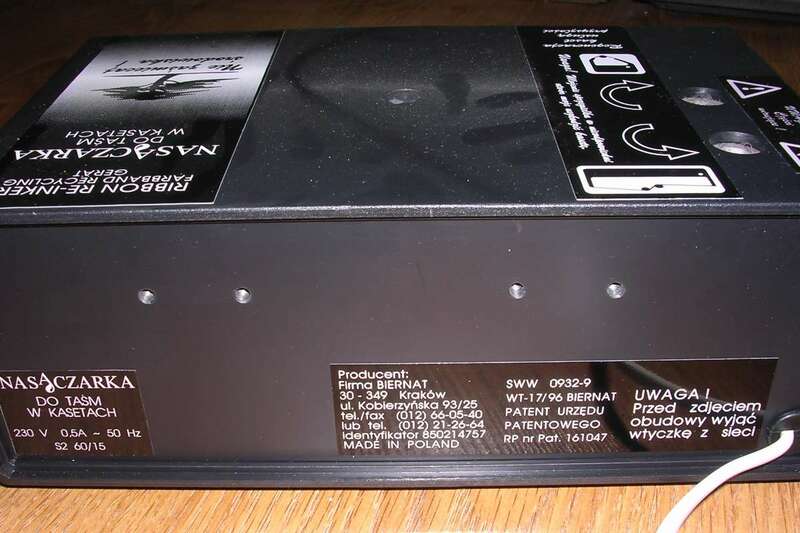 The printer used a 13.5V /1A DC power supply with + on the inside and - on the outside of connector. Unfortunately there were problems. 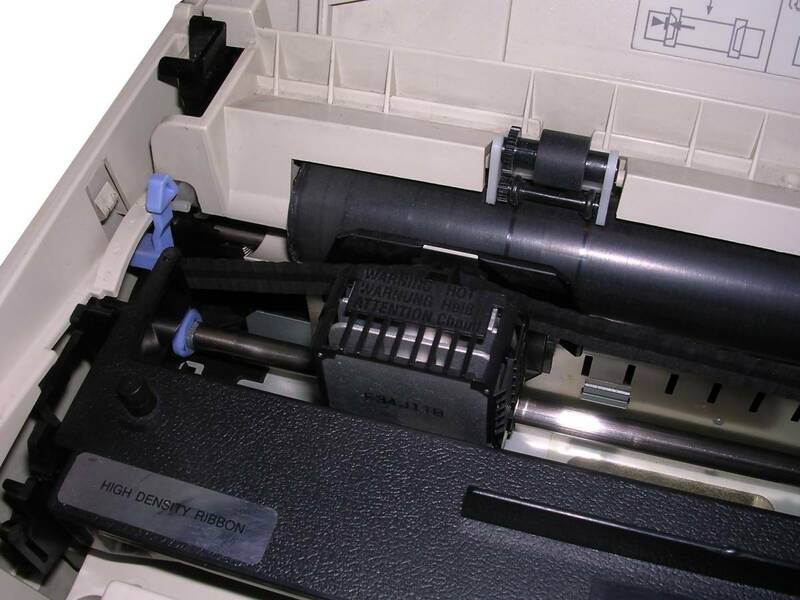 Heat-based printing heads had short lifetime and required specific type of ink, so printing head and ink cartridge was one replaceable component. 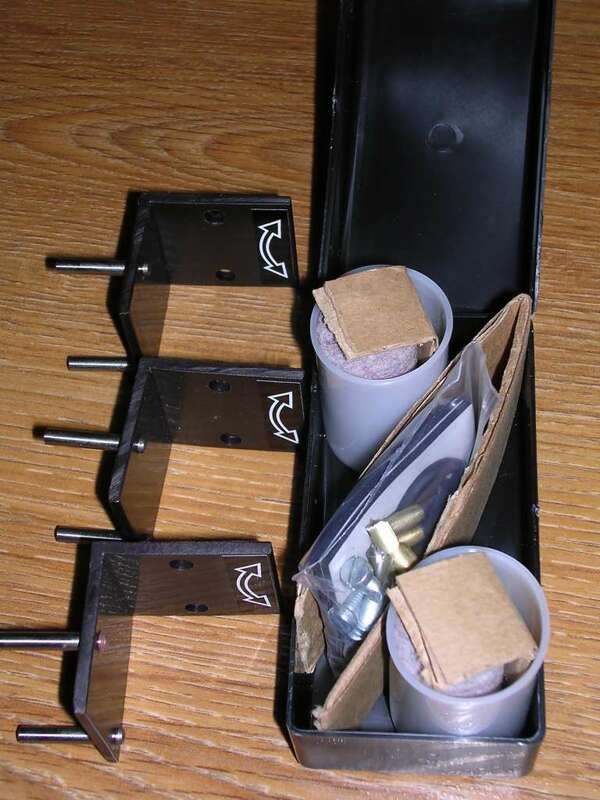 Additionally even new cartridges had to be stored in a very specific way in a special box, if not stored properly some nozzles were easily clogged making a bad line drops on print-out. 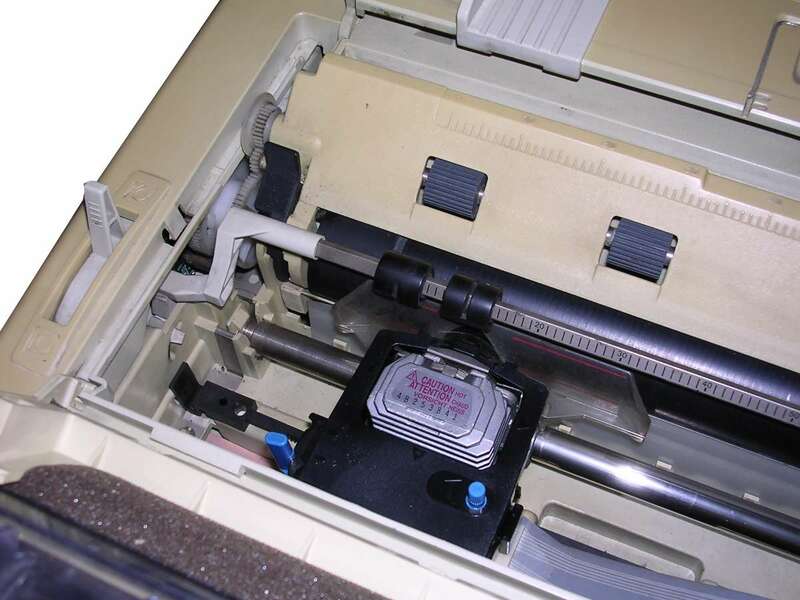 The fix for it was doing repetitive "clean head" procedures, putting the cartridge's nozzle part into a pot of warm water, or even using special plastic devices to hold the cartridge and remove some ink using syringe. 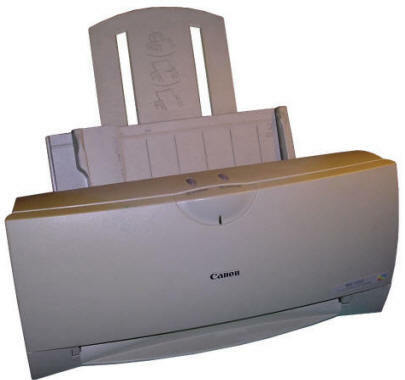 Most of these printers bought with home computers were never used with "photo" cartridges as they were expensive and required special paper for best effects. 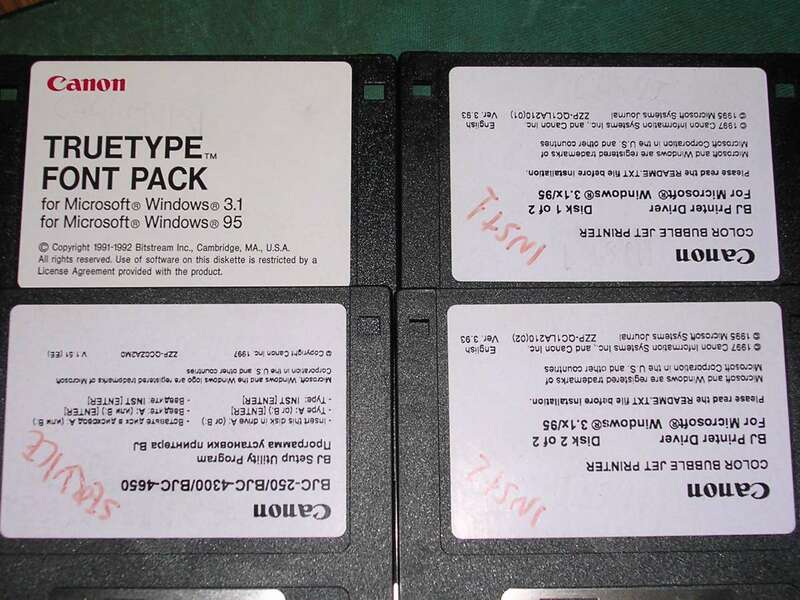 The printer came with manual, driver disks and font pack disk. 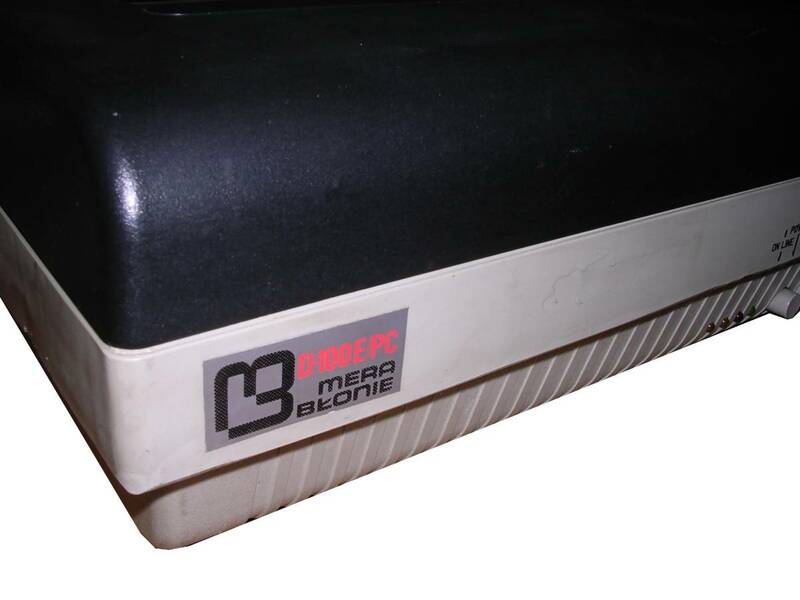 BJC-250 was quite successful among home users - price was reasonable and cartridges with heads built-in, were accessible. 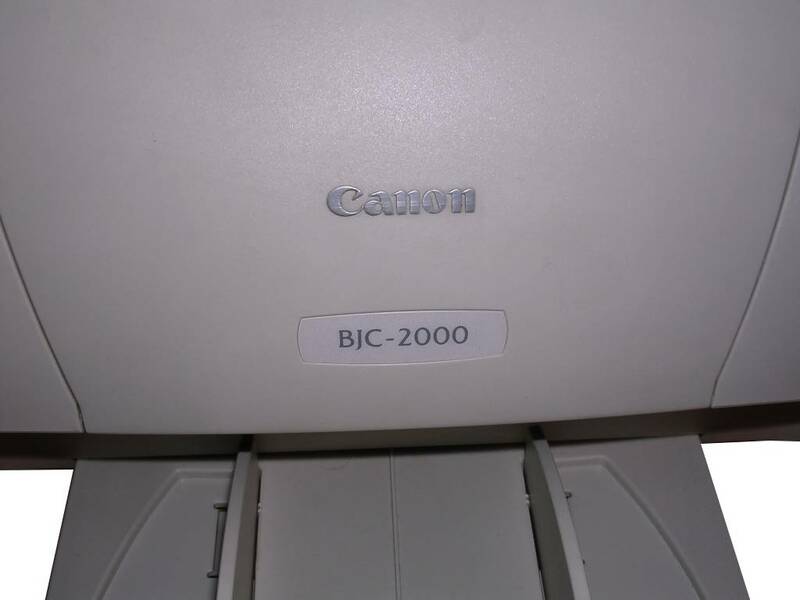 BJC-1000 and 2000 were next steps in development - the head was moved to printer instead of cartridge, so theoretically cartridges could be cheaper, and it was possible to hold both black and color cartridges. Unfortunately the cartridge replacement mechanism was troublesome and capacity was practically smaller than in 250. Additional changes included small front door with replacing mechanism and built-in power supply unit. After having BJC-250 and BJC-1000 I have learned one thing: Don't buy ink-jet printer. 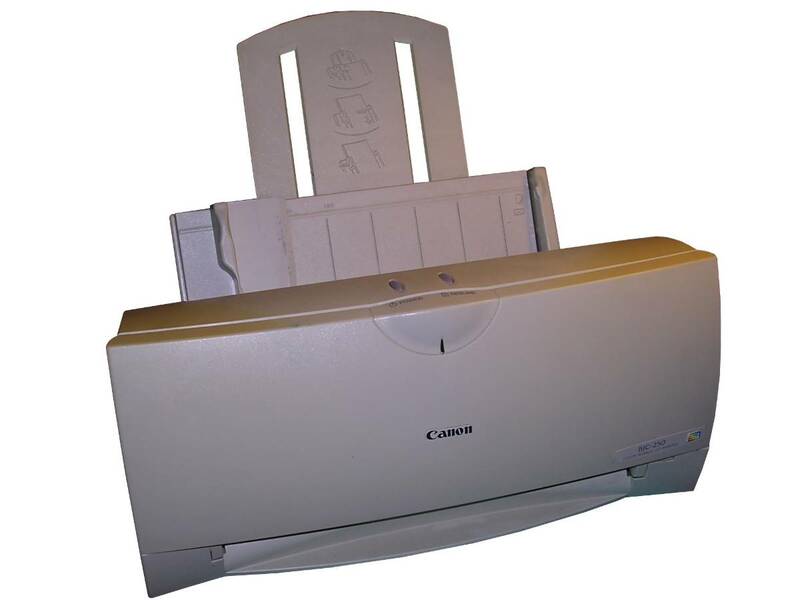 If you do black and white prints only, cheapest laser printers with replacement toners are much more efficient, if you make color prints in a home scale, it's usually cheaper to print in a nearest xero-copying service with laser printers instead of having bad color prints.